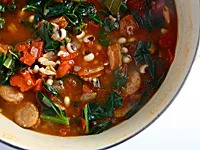 Warm up and start your year off right with black eyed pea stew, an old Southern tradition that is said to bring luck for the coming year! The stew gets even tastier as it sits, so leftovers are ideal! This week's menu also features a simple, one-pot pasta feast that comes together in less than 20 minutes. 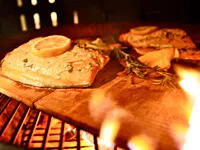 Finally, put on that parka and fire up the grill for some cedar-plank salmon, a healthy favorite that is effortlessly gourmet. Enjoy this thick and hearty stew to ensure good luck all year! 1. Heat canola oil in a large Dutch oven over medium heat. When hot, add chopped onion and saute until soft and translucent, about 6 minutes. Add garlic and saute 30 more seconds. 2. Add chopped sausage and stir everything together. Cook for another 5 minutes, stirring often, so the sausage can brown a bit. Add vegetable stock, black eyed peas, cayenne pepper, and salt. Bring to a boil, then reduce heat and simmer for 15 minutes. 3. Add tomatoes, collards, and vinegar. Simmer for another 10 minutes or until the greens have wilted and cooked down a little. Serve with hot sauce and cornbread on the side. Healthy and delicious! This salmon makes perfect leftovers to toss on salads or between country-style bread. 1. For the marinade, mix all ingredients together. Pour over salmon and refrigerate for at least 30 minutes (preferably an hour). While fish is marinating, heat grill to 450 degrees. After the salmon has marinated, lay on soaked planks and top with thin lemon slices and rosemary. 2. Lay planks on grill and cover. Cook for 25 to 30 minutes, depending on thickness. Before you pull off the grill, make sure the internal temperature of the salmon has reached 125 degrees. 3. Let salmon rest for 5 minutes after taking off the grill, then slice and serve with additional fresh rosemary. This is a simple and healthy one-pot meal that comes together in less than 20 minutes! Leftovers make great packed lunches. 1. Cook pasta according to package directions in boiling salted water. When cooked, drain and reserve 1/2 cup of cooking liquid. Set aside. 2. In a large skillet or Dutch oven, heat olive oil. Add minced garlic and saute for 2 minutes, until toasted and fragrant (be careful not to burn!). Add the cooked pasta, beans, and spinach, and cook until spinach wilts. Add lemon zest, juice, salt, cayenne, and cheese, and toss well. Add some of the cooking water if the mixture seems dry. 3. Drizzle pasta with olive oil and serve with cracked pepper and additional freshly grated cheese.